September 5, 2015, Queens, NY Don’t call it a comeback. It’s become par for the course. For the third consecutive match, Donald Young has come from behind, on the brink of elimination, to defeat a higher-ranked opponent. This time the victim was 22nd ranked Viktor Troicki from Serbia. Young was down two sets to win 4-6, 0-6, 7-6, 6-2, 6-4, in arguably his greatest victory. He was down, but not out. And I mean down. “It was 90% you guys, and 10% me,” said an exhausted by jubilant Donald Young during the post-match interview. His back had tightened up, and he was bageled (shut out in the second set). But he fought like a champion and won the tiebreaker in the third set. US Open Prize Pool Finish Winnings Winner: $3,300,000; Runner-Up $1,600,000; Semifinalists $805,000; Quarterfinalists $410,975; Round of 16 $213,575, Third Round $120,200; Second Round $68,600; First Round $39,500. 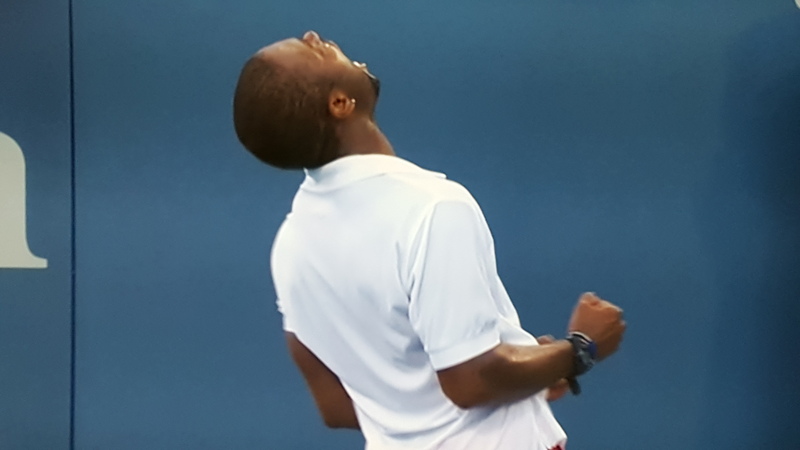 On Monday, Donald Young joins 13th seeded American, John Isner, who will be facing tennis’ greatest men’s player, Roger Federer, in the Round of 16. Young will play the winner of the Stan Wawrinka-Ruben Bemelmans match. Wawrinka is the 5th seed and winner of this year’s French Open. It seems that when Donald Young is down, he’s up. But as the competition stiffens, the “Young Gun” might want to change that strategy. ← Previous Story DONALD YOUNG, NOT DONE!